Initial public offerings (IPOs) are an important way for businesses to grow, innovate and better serve their customers. Yet, the number of public companies has declined 46% since its peak in 1996. Deal value and the number of deals has fallen as well, particularly small capitalization IPOs. In this primer from SIFMA Insights, we review why this decline might be through an exploration of the IPO process and listings exchanges. An initial public offering (IPO) is when a private company raises capital by offering its common stock (equity) to the public in the primary markets for the first time. Companies may need capital for various business purposes – invest in growth, fund mergers and acquisitions, etc. – and firms have several ways they can generate capital, including issuing IPOs. IPOs allow businesses to grow, innovate and better serve their customers. 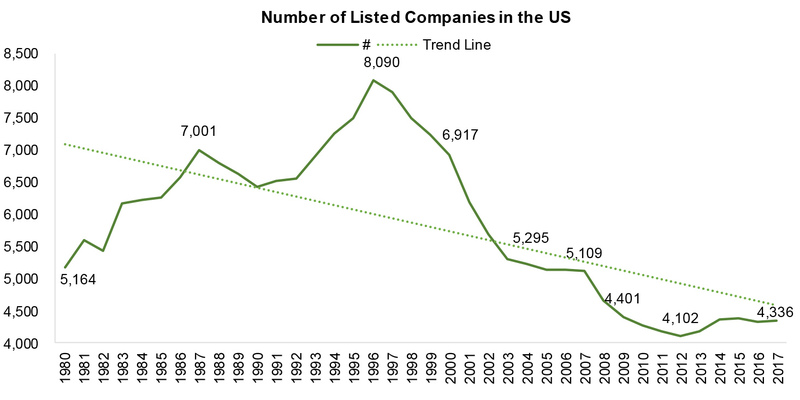 The number of U.S. domiciled listed companies has been on the decline since the mid-1990s. While the number of listed companies peaked in 1996 at 8,090, the number is down to 4,336 as of the end of 2017, -46% since 1996. The regulatory environment also led to a decline in IPO deal value and number of deals. The number of IPOs peaked in 1996 at 860 but was down to 169 in 2017 (-80% from the peak, a -7% CAGR) and stands at 103 YTD (through June 2018). The number of small capitalization IPOs as a percent of the total has also declined post-crisis. While in the low 90% range pre-crisis, it remains in the low to mid 80% range over the past few years. The decline in the number of small cap IPOs implies fewer innovative American companies see the benefit of going public in today’s regulatory environment, which could have long-term negative effects on economic growth. An SEC survey of CEOs showed that while 100% of participants noted a strong and accessible IPO market is important the U.S. economy and global competitiveness, only 23% felt the IPO market is accessible for small companies. Market participants, regulators, academics and legislators have weighed in over the years on the reasons for the decline in listed companies and number of IPOs. This report reviews several of the suggested factors, including: compliance burdens and costs, litigation concerns, declining research coverage, growth in passive investments and growth in private markets. We also look at proposals and suggestions to change equity market structure for low volume stocks to increase the efficiency of trading these stocks. This report also explains the IPO process. Underwriting is the process during which investment banks (the underwriters) act as intermediaries, connecting the issuing company (issuer) and investors to assist the issuer in selling its initial set of public shares. The underwriters will work with the issuer to determine what the IPO should look like and the best time to bring the deal to the market. Underwriters guide the issuer through the process, not only handling all the required paperwork and performing a detailed analysis of the company, but also assisting management in addressing investor concerns to get investors interested in the deal. Finally, this primer assesses the market structure for listings exchanges. When a company decides to go public, it will become listed on a national securities exchange. The listings exchanges have their own criteria for firms to qualify to list on their exchange (financial status, number and types of shareholders, percentage of public float after the IPO, etc.). The corporate listings business is highly competitive, with significant barriers to entry. As such, there are only two main listings exchanges in the U.S.: the New York Stock Exchange and Nasdaq. The primer series from SIFMA Insights goes beyond a typical 101-level brief, breaking down important technical and regulatory nuances to foster a fundamental understanding of the marketplace and set the scene to address complex issues arising in today’s markets. See our full series here.